Less than 48 hours before he vacates the presidency, the Haitian president embarks upon a mission to win security guarantee from his adversaries. He wants to make sure that all prospective charges against him be kept at bay and that he be allowed to roam freely like his predecessor René Préval. In a desperate attempt to reclaim the initiative, Martelly has called for an OAS mission which has been completely shunned. Then he tried to negotiate his exit, dumping his Congo Sapeur Jovenel Moise in exchange for names like Deeb and others—people whose records are dubious at best. So far, all has failed. Like a trapped bobcat in the Florida Everglades, his political faith has been sealed. He can only run, but the swamp is too shallow for him to hide. As a man who suffers from obsessive compulsive disorder (OCD), Martelly can’t imagine himself benched on a docket while waiting to be sentenced for crime against the State—for pillaging the State treasury, for embezzling millions of dollars, for abandonment of an endangered people and for degrading the Office of the presidency to which he had sworn to upload to the highest standard. Instead of building democracy, he fomented a kleptocracy and morphed its members into international panhandlers like a parasitic drain, using Haiti’s misery as their best public relation scheme to raise money for themselves and their close associates. Martelly’s vulgarism reigns supreme to the very last minutes of his term in office. He is now using bribery and intimidation to win concessions. The problem with that is there is no one in Haiti who can deliver such immunity he is seeking. As it stands now, no Haitian has neither the moral nor the political authority to provide the safe haven he is dying for. Consequently, he has been using scare tactic to force the hands of his enemies. He has activated his wild dogs headed by death squad leader Guy Phillipe, unleashing them to take on unarmed demonstrators who are demanding that he be trialed for treason. Conceding defeat, he wants to make Haiti pay for her temerity. He has ordered his henchmen to create a bloodbath in order to provoke a US military intervention in the hope that his estranged master would come to the rescue or at the very least would provide him the elusive security he is looking for. 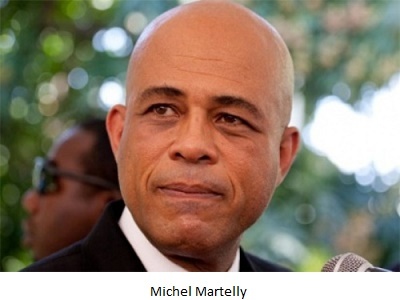 In a stunning reversal of fortune, Michel Martelly is learning the harsh reality of those who live at the receiving end of insults, humiliation and starvation. Rolling in the deep was never meant for only those who live in the outer boundaries of society. Michel Martelly aka Sweet Micky goes down in history as the most grotesque, queered, indecent, indelicate, offensive, coarse, crude, distasteful, bawdy, pornographic and ultimately X-rated head of state Haiti has ever known. He will not be allowed to shoot his way out of this spider web. The Duvaliers were sadistic, but Micky’s regime, which operated in the narrowest sphere of dictatorship, was never allowed to spoil the show. As an apprentice proxy, he was in constant containment. This week, his vulgarism reaches a new high when, in a released soundtrack, he took aim at flamboyant and prolific journalist Lilianne Piere-Paul, throwing all kinds of insults—sexually charged. Indignation has poured in from all corners of Haiti. This also shows an urgency for responsible Haitians to start getting involved in politics. They can’t sit idle and let dirty-foot vagabonds, eccentric charlatans, imbeciles and arrivistes to rule their lives. In the absence of responsible individuals, the boogeymen will fill the void. So ill-mannered, Martelly never understood the power that was bestowed in him. As a crack-headed stooge who only bows and wags his tail before his white masters, he could only foresee the presidency as nothing but an opportunity to steal and squander lavishly while millions of his fellow countrymen have resorted to selling their pride, their dignity just to make it through the day. The next few hours are critical. Haitian compatriots, do not play in the enemy’s own game. Martelly’s provocation must be met with the strongest show of unity. Haiti will live through the dark tunnel to see the better days that lie ahead. Hold firm! Kenbe djanm!